If you’re a traveler, you probably have a to-do list that you go through prior every trip to ensure that you, and all other travelers in your group, will be safe from pre-departure to the return. Most likely, you’ve got a list of things that you routinely go through every time you travel: exchanging money, making sure to carry it something safe, letting the bank know you’ll be out of town, stocking up on medicine to bring, making sure your luggage isn’t overweight, and so on. One thing that travellers rarely think about is protecting their hearing. When was the last time you thought about this? Today is National Save Your Hearing Day. In honor of this, here’s a word of advice for travelers – protect your ears when flying! Many of you know that I suddenly lost all my hearing one day. There’s no way to tell what caused it, nor do we know if there’s anything that I could have done to prevent it. But, since I am avid flyer and literally flew 10 flights in 2.5 weeks right before the incident happened, one of the many possible reasons why I loss my hearing could be because my ears were damaged by the air pressure on all those flights. Wait, what happens to your ears when you fly? If you’ve been on an airplane before, you may have seen parents preparing their kids for take-off and landing by giving them gum to chew on or juice boxes so they can drink. You may even do these yourselves, because they ease ear pain and discomfort due to air pressure. Simply swallowing and opening your mouth wide helps alleviate the pain, but kids don’t know that. But why does this pain occur, and how does swallowing help it? When you hear sounds, you’re actually feeling vibrations which travel through your external ear canal, and through your eardrum. 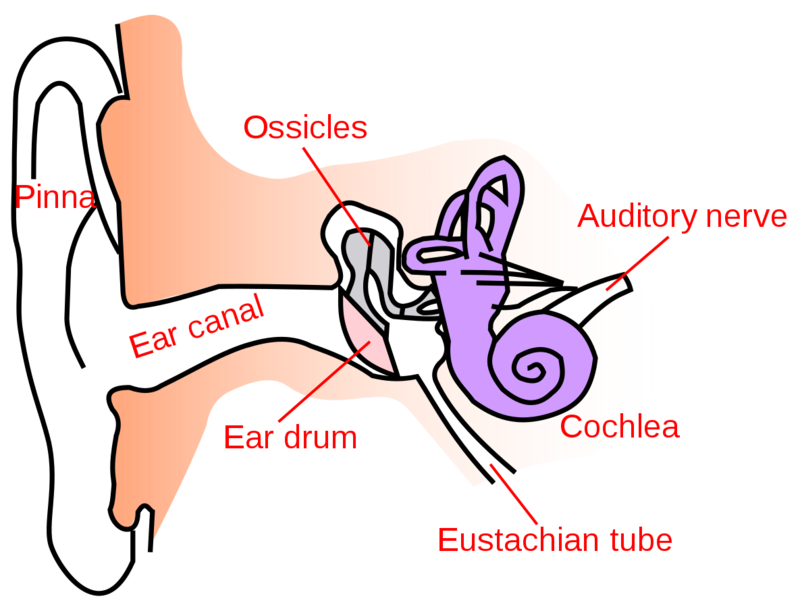 On the other side of the eardrum, there is a tube called the Eustachian tube. This tube allows air to flow out from the inner ear via the nose and throat. When you have a cold, you may feel like your ears are blocked – this is because the Eustachian tube is blocked with mucus, or inflamed due to a fever or infection. There is less air pressure at 30 000 ft in the air than at ground level. There is air on both sides of the eardrum. Before take off, the air pressure in the external and middle ears are the same. But as the plane ascends, the air pressure in the external air drops. Because there is now more pressure in the middle ear than the external ear, the eardrum bulges outwards. During landing, the opposite happens – there is more pressure in the external ear than in the middle ear, which makes the eardrum get pushed inwards. When you swallow, the Eustachian tube opens briefly, letting air in or out of the middle ear. This causes the air pressure level in the external and middle ear to equalize a bit and lessens the pain. The earache you get in airplanes, or “airplane ear,” are usually minor. However, over time or over long and frequent flights, these conditions can worsen, leading to more severe conditions like muffled hearing or hearing loss. I’ve definitely been guilty of staying up all night the night before a flight to make the most of a destination or to just not sleep in and miss the plane, and then crashing as soon as I board. Not wise. Why? Because that’s when the altitude and air pressure shift most rapidly. During these, it’s best if your awake to swallow/chew/yawn to equalize the air pressure, because not doing so could result in permanent ear damage. Have you ever started feeling under the weather as soon as you’ve gotten back from a trip? Your chances of getting sick when flying are pretty high because that during a flight, you get dehydrated, tired, maybe stressed, and you’re also breathing filtered air. If you fly with a cold, especially if you have sinus congestion, or worse, a sinus infection, your ears are more sensitive and the air pressure can damage or even rupture your eardrums. Self-explanatory, I think. There is such thing, such as EarPlanes, which have a ceramic plug in the middle that move when pressure changes so that your ears have time to adjust to the pressure level. Turn down the volume when blasting those speakers or wear earplugs when near noisy machinery or any loud environment. Not only can they damage your eardrums, but cleaning your ears too often isn’t healthy. Earwax actually stops dust and other particles that aren’t good for the ear from entering it. Instead, use a damp towel, an earwax removal solution, or see your doctor. Exercise is great for everything, including your ears! Cardio workouts cause blood to get pumped to all parts of your body, including your ears, which helps all parts of your ear stay healthy. Stress isn’t healthy for anything, including your ears. When you’re stressed, your nerves fall under pressure, your blood flow changes, and your body just isn’t as strong. Stress is thought to cause tinnitus, or ringing in the ears, and even some hearing loss. Visit your doctor and see an audiologist regularly. Hearing loss usually happens gradually, so hearing professionals will be able to help you take action on preventing or treating it right away, which is important. Happy National Save Your Hearing Day! Stay updated on this blog – like my Facebook page!